Boeing’s next twin-aisle strategy: Aspire Aviation has this long article looking at when Boeing will launch the 787-10 and 777X. We know Boeing continues to wait as long as it can in hopes Airbus will commit to a final design of the A350-1000 before launching the 777X, but time may be running out unless Boeing is willing to extend the gap between EIS of the -1000 and EIS of the 777X. A 2018 or later EIS of the 787-10 means Boeing will avoid the EIS of two airplanes (the MAX and the -10) simultaneously, which could be a lesson-learned from the 787/747-8 programs. Readers may recall that Jim Albaugh, former CEO of Boeing Commercial Airplanes, said Boeing would avoid this in the future after experiencing the problems of the two programs. Perhaps, and this is speculation, extending the time between EIS of the 787-10 and the 777X is partly driven by the same concern. Given program history, at least some Wall Street analysts we’ve talked with are already raising the prospect that the 737 MAX EIS (4Q2017) might slip. Why? They are concerned about the broadening design creep as well as development of the CFM LEAP-1B. Can they point to anything concrete? Not yet. Chalk the conversation up to Boeing’s poor performance on the 787 and 747-8 programs and the fact that there are still industrial issues with the 787 suppliers, according to the chatter. You read it here first: Aviation Week reports Lion Air is considering Airbus A320s to supplement its Boeing 737 fleet. We reported this on September 24. ← Boeing and SPEEA: were they in the same meeting? Nothing on the ever growing A330 @ 242 T ? Basically wrote about this way back in May. ( plus center tank inerting for the -300 ( or for both subtypes? )). Is that what Boeing wanted to “hatch” with rumours over that 787-10 offering ? The link to Aspire takes you to an article about the ad war between Airbus and Boeing, and not mentioning anything about Boeing wide body strategy. You might want to update your link. The B-787-10 will be about a 7500 nm airplane, almost 1500 nm more than the proposed new 238 tonne A-333 varient. Plus it will have a lot more cargo volume, even the B-789 currently will have some 300 ft3 more than the A-333, the B-7810 should have twice that (or more), some 600 ft3 + more volume. The A-330 is a 1980s era airplane grown out of the late 1960s vintage A-300 design, while the B-787 is a modern 21st century design, fresh from a clean sheet of paper. So, let me see? Each will carry about the same number of pax (290-300), but one can go much further, carry more cargo, and make more profits for the airlines. One has 1970s to 1980s era engines, and the other has 21st century engines. Both costs about the same to aquire (give or take a few million USD). Under real life conditions, flying close to MTOW the 787-10 will be a 5000NM aircaft. 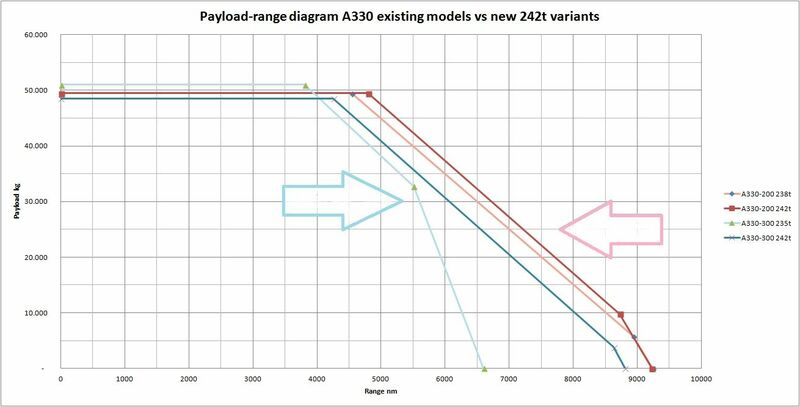 Today airbus announced a new 242t A333 version, not 238t. And the option to take more fuel. Regarding the engines you are right. Eighties technology, but continiously enhanced. Let wait for he almost inevitable Trent Ten or GENX + Sharklets upgrade and see how things go. Airlines have become carefull about Dreamliner promises. KCTopboom I had the impression you have a strong show me first approach about aircraft (A350, A400m) that haven’t entered service yet..
What’s the 242t A333’s range under those same real-life conditions? The A-330 is a 1980s era airplane grown out of the late 1960s vintage A-300 design, while the B-787 is a modern 21st century design, fresh from a clean sheet of paper. So what? Can’t we try to find better arguments than that? The 767 is outselling the 777 this year, so there is a better case for a 767X. The 777 is obsolete between the 787, A350, and the super awesome 747-8. Better to spend that money in the future on a clean sheet design of some sort. What’s the 242t A333′s range under those same real-life conditions? fresh rumors are that the -10 will get 6 wheel bogies for an increased MTOW.